I tend to make a lot of things from scratch instead of buying them. Usually things made from scratch taste better and they are better for you because they are made with real ingredients instead of processed ingredients. The downside is that making things from scratch can take a long time - and people who are busy or have families don't have time to add that extra step to their meal prep. Good news! Curry paste is not one of those things that takes significantly longer to make! This added approximately 10-15 minutes to my prep time and in my opinion it was totally worth it. Put frying pan on medium high heat and add the cumin seeds, coriander seeds and black peppercorns to a dry pan. Lightly toast them for a few minutes until golden brown and smelling delicious. Remove the pan from the heat. Add toasted spices to a pestle and mortar and grind until fine (or put in food processor and whiz to a powder. Add ground toasted spices to food processor, add remaining ingredients and whiz until you have a smooth paste. Use in curry recipe as you would use a store bought paste. While it sounds like a long list of ingredients - I had just about everything in my pantry already! I just needed to buy the fresh ingredients like the jalapeno and the cilantro. All in all, its a pretty cost effective way to make curry paste. I highly recommend this recipe! 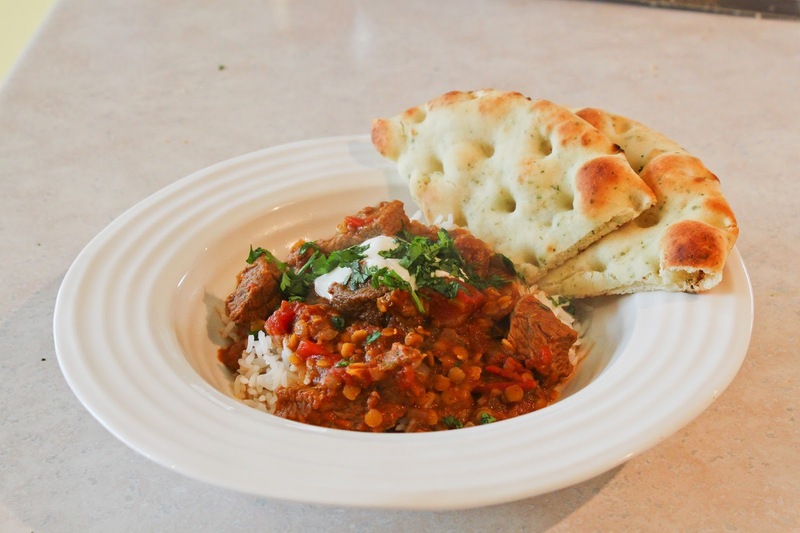 I used this curry paste in Jamie Oliver's Lamb Rogan Josh recipe (I used beef instead of lamb) and my huby thought it was the best Rogan Josh I've ever made. It was definitely as authentic tasting as takeout from our favorite Indian restaurant. Thanks for stopping by! Happy cooking my friends! It's time for another pantry basics post! In past pantry basics posts we've covered Olive Oil and Coconut Oil, so I thought it was only fitting to also cover butter to round out the picture. Butter is a dairy product made by churning fresh milk or cream to separate the butterfat from the buttermilk. The colour will vary depending on the animal's diet, but in today's world it is often altered artificially during the manufacturing process. Look out for ingredients such as annatto or carotene as these are typical indicators of artificial colouring. 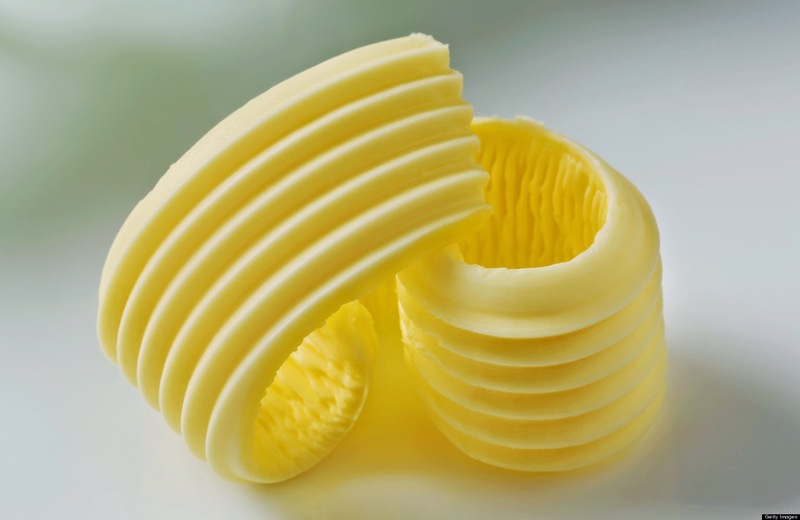 There is an age-old argument about whether butter or margarine is better for your health. We're not going to address that in this post - there are some great articles out there debating the health benefits or issues of both options. Just do a google search "Butter vs. Margarine" and check out some of the articles that come up. What I do know is that a) My hubby and I both agree that the taste of butter is significantly better and b) Butter tends to contain less processed ingredients and is more in line with our eating goals of eating less processed foods. Therefore in our house we always choose butter! Cultured butter is traditionally made from fermented cream. It is considered to be superior in taste and to have a fuller flavour. Using today's manufacturing methods, cultured butter is now made with fresh cream and during the manufacturing process, bacterial cultures and lactic acid are introduced to the mixture. This provides the same cultured taste in a far more efficient production process. Cultured butter is also known as European-Style butter as it is preferred in Europe. Sweet cream butter is made from pasteurized fresh cream. Sweet cream butter is the butter preferred in the United States and Canada and it tends to have a less full/ buttery flavour compared to that of cultured butter. It typically keeps in the fridge for several months at a time. Raw cream butter is the same as sweet cream butter but it is made with unpasteurized milk. Since it is very difficult to find unpasteurized milk unless you get it straight from the farm, this raw cream butter is typically only homemade. The shelf life is very short - it only keeps for approximately 10 days. 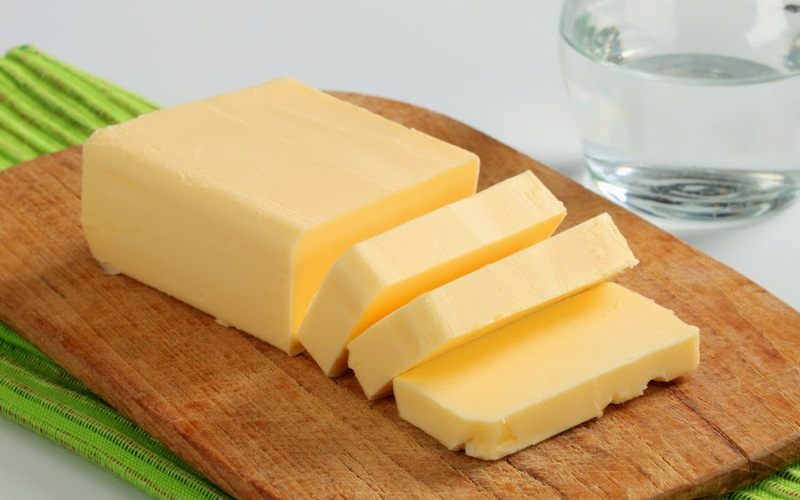 As a result of the above methods, this product tends to be highly processed (somewhat like margarine) and defeat the purpose of selecting butter over margarine in the first place. Clarified butter is commonly used in Indian cooking. It is nearly pure butterfat as it has been clarified to remove most of the water and milk solids from the product. The clarification process takes place by heating the butter to melting point and then cooling it back down. Once it cools, it settles into three layers that separate by density - whey proteins on the top, butter fat in the middle and then the water and casein proteins settle at the bottom. The advantage to clarifying butter is that it can then be heated to higher temperatures without burning as all of the milk solids which typically burn if butter is overheated, have been removed from the butter during the clarification process. Most baking cookbooks will have a section on butter and baking. The most common topic for discussion is whether to use salted or unsalted butter. 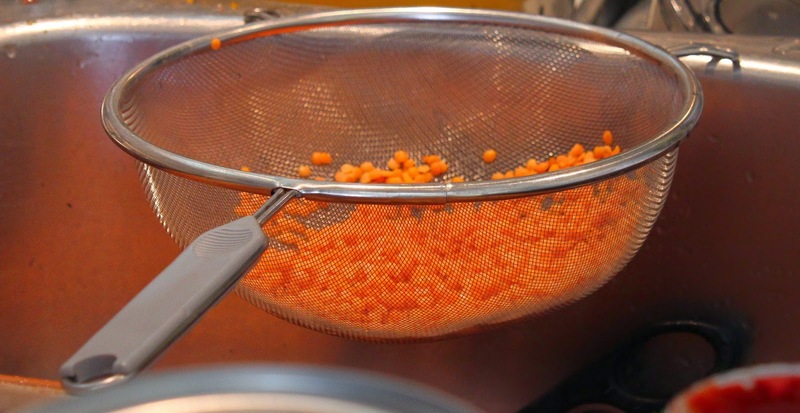 With salted butter, salt is added to the butter in the form of granules or brine during the manufacturing process. Salt preserves the butter and therefore gives it a longer shelf life than unsalted butter. But this also tends to indicate that unsalted butter is fresher than its salted counterpart. Unsalted butter is most often recommended for baking as it is much easier to control the saltiness of recipes by adding all of the salt yourself. Since each brand of butter adds different quantities of salt depending on their individual manufacturing process, the saltiness of any brand of butter or even production batch of butter can vary widely which can therefore impact the amount of salt you would want to add to your baking. For example adding a standard 1/2 tsp of salt to a batch of cookie dough could result in very salty cookies if the butter is quite salty or in flavourless cookies if the butter is not very salty. Therefore, starting with unsalted butter gives the baker more control over the consistency of the end product. If butter has melted and then solidified, don't use it in your baking! Melting butter changes the properties of it and therefore when mixed with flour, it won't incorporate in the same way it would if it had never melted! You can freeze butter for up to 4 months after purchasing it! Place it in a freezer bag to retain the flavour. 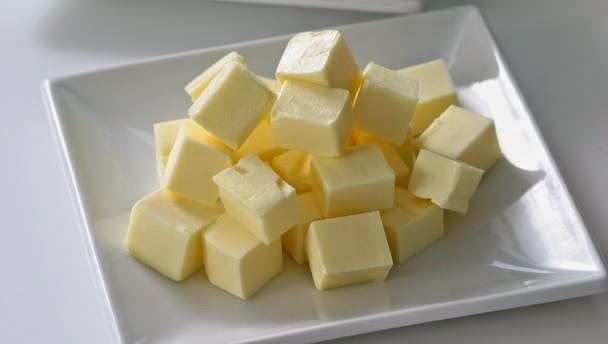 To soften butter quickly, cut the butter into 1 inch cubes, place in a single layer on a plate on the counter. Butter should soften within 15 minutes. For baking, don't ever soften butter in the microwave! To preserve butter keep it tightly wrapped! Exposure to air and light increases the speed of butter going rancid. It also helps to avoid the butter absorbing other odours that may be present in your fridge. Wrapped butter will keep for several months in the fridge. Finally, lets end with some fun facts about butter! According to Wikipedia, differing varieties of butter are found around the world. "Smen is a spiced Moroccan clarified butter, buried in the ground and aged for months or years. Yak butter is a specialty in Tibet; tsampa barley flour mixed with yak butter, is a staple food. Butter tea is consumed in the Himalayan regions of Tibet, Bhutan, Nepal and India. It consists of tea served with intensely flavoured - or rancid - yak butter and salt. In African and Asian developing nations, butter is traditionally made from sour milk rather than cream." Butter actually contains very little lactose as it is mostly just milk fat. This is why butter often doesn't bother people with mild lactose intolerance. Also, if you want to try your hand at making homemade butter here's a great tutorial. You don't need any special equipment - you can use your stand mixer! Why not give it a try! You'll be amazed how delicious freshly made butter is. Thanks for stopping by! If there's any other ingredients you're curious about and would like to see featured in the Pantry Basics series, please let me know! Good Morning friends! Surprise, I'm back! 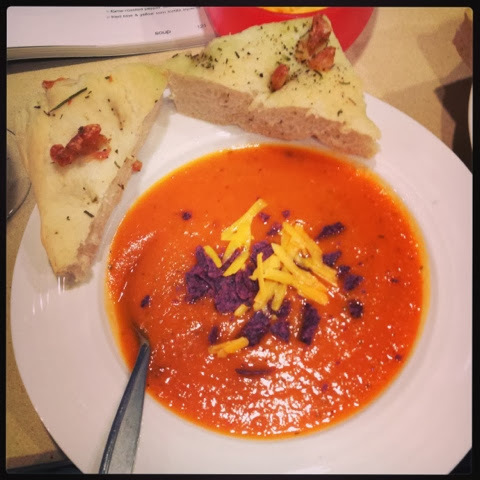 My life has been crazy and I have been going through some huge life changes during the last 6 months or so and my blogging and baking/ cooking has been put on the back burner. I don't know how regularly I will be back here, so I'm not making any promises, but I've been missing all of you and missing spending some QT in my kitchen. I will post some more about all of the life changes and craziness soon, but I want the focus of this post to be this spectacularly delicious quick bread. It is totally worthy of a post devoted to its awesomeness. The quick bread name is a little deceiving for this bread if you decide to make it all at once. Caramelizing onions properly takes time (read minimum 30 minutes). But the good news is that you can caramelize the onions and cook the bacon ahead of time. My method has you making the bacon in the oven while you caramelize the onions on the stove top, which will be the most efficient and least messy way to do the prep work! First things first - cook your bacon and caramelize the onions. 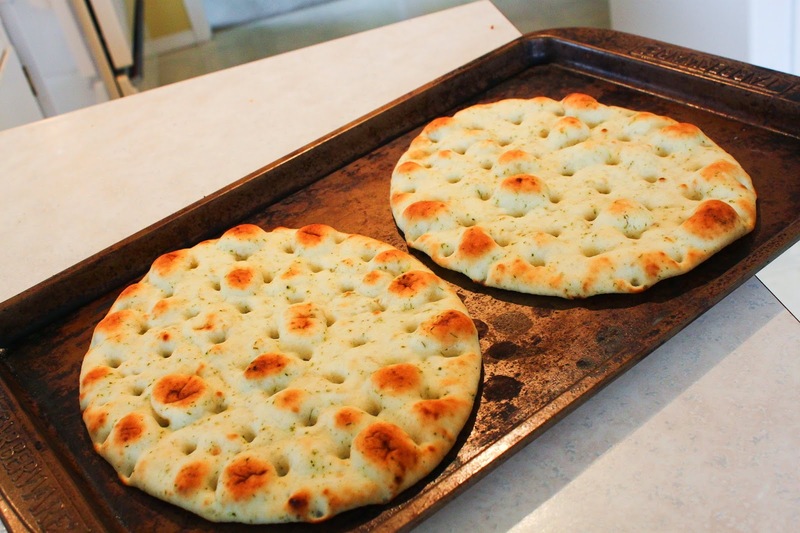 You can do this up to 2-3 days ahead of making the actual bread. Preheat the oven to 400F. Line a baking tray with parchment paper and lay the bacon in one layer, making sure the edges of the bacon don't overlap. Cook the bacon for 15-17 minutes or until crisp. Remove from tray to a paper towel lined plate and let cool. While the bacon is cooking - melt 3 tbsp. butter in a medium non-stick frying pan over medium-low heat. Add onions. Cook, stirring every few minutes and making sure they don't brown, until onions are soft and caramelized. This should take approximately 30 minutes. If onions are browning, your heat is too high. Remove onions from heat and let cool. When ready to prepare the bread, preheat oven to 350F. 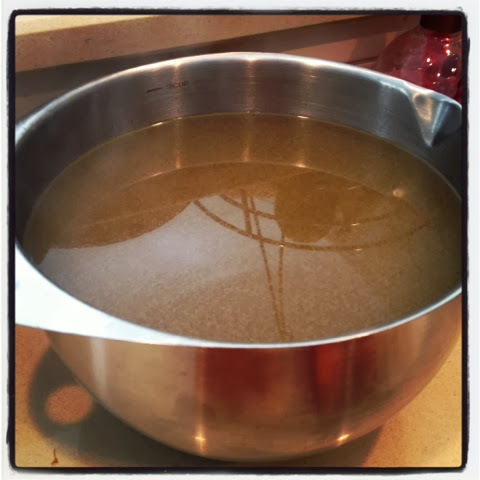 Grease a 9x5 loaf pan or line with parchment paper. Don't skip this step or skimp on the grease!!! The cheese can stick to the pan as it cooks, so you need to grease well. In a large bowl, whisk together the flour, baking powder, salt and pepper. Make well in center of bowl. In a medium bowl, combine milk, EVOO and egg. Mix until combined. Add liquid mixture to dry ingredients. Gently fold mixture together until flour is incorporated. Chop the bacon into small pieces. Add bacon, cheese and onions to batter and mix together gently. Don't over mix or you will have tough bread. Place mixture in prepared loaf pan and bake in preheated oven for 45 minutes or until a toothpick inserted in middle comes out clean. Let cool as long as you can bear it and then remove from loaf pan and slice. Delicious topped with butter or jam for that sweet-savory combo. I'm pretty sure this is my favorite quick bread recipe thus far and I know its my hubby's favorite too. It doesn't last long in our house. I hope you enjoy it as much as we do. The thing I love about this recipe is that you can mix it up - add some herbs and spices that you like, change up the type of cheese or change up the type of meat - you could do prosciutto (go easy on the salt if you decide to do that though), left over ham, etc. The possibilities are endless! I'm so glad to be back! Hopefully you'll be hearing from me more often this summer as we get settled into our new life. :) Happy baking my friends! Hey Friends! I realize its been a while since I updated my blog... Not even going to try to make excuses for whats going on or why I haven't been posting much. What I am going to do is bring you a delicious soup that will warm you through and through despite this cold weather we've all been having. A delicious roasted garlic and yam soup. This soup is a bit time consuming due to the many layers of flavours that go into it! You can make the veggie stock a day or two before and you can roast the veggies ahead of time too if you want to speed up the process. If you really don't have time and need to skip one of the steps - just buy the veggie stock. Don't skip roasting the veg - it adds such a delish layer of flavours that you can't miss out on to enjoy the true delightfulness of this soup. First things first - make the veggie stock. You can find a delish recipe here - though it will make more than you need for this recipe, just freeze the rest and use it up as you see fit. Next you can get started on the recipe below. Preheat oven to 375F. Using a fork, pork a few holes in each yam. 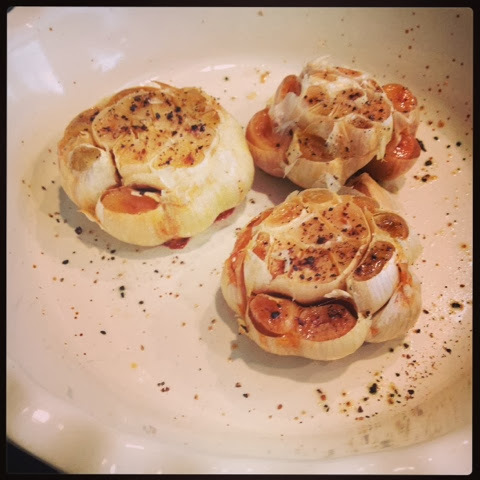 Cut the top 1/4 off the garlic to expose each of the pieces of garlic inside, drizzle each head with olive oil then wrap in foil. Place yams and garlic on a baking tray and roast in preheated oven for approximately 45 minutes. Yams may need a bit longer, but garlic should come out after 45 minutes. 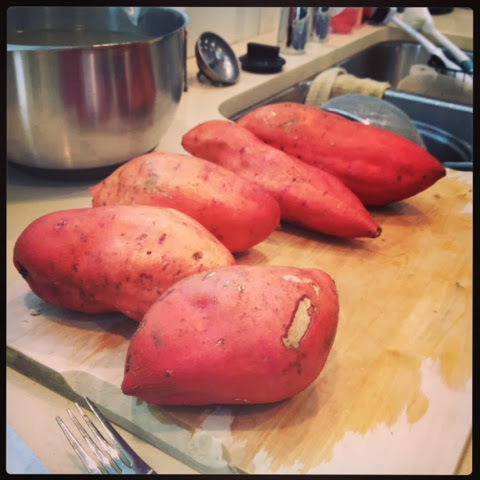 Yams are done when they are very tender. Cool slightly, then remove yams and garlic from their skin. Halve and seed the peppers. Place peppers and whole tomatoes on a well-oiled baking tray and roast until skins are browned and puffed (about 15 minutes). Transfer to a bowl and cover with plastic wrap for approximately 10 minutes. Peel away the skins and set aside. Heat the oil in a large soup pot, add onions and saute until translucent. Add garlic, spices and herbs and cook until garlic is fragrant (about 1 minute). Stir in the peeled, roasted veggies, the stock and the chipotle puree. Bring to a boil, reduce heat and simmer for about 20 minutes. Puree the soup until smooth. Whisk in maple syrup and lime juice. Season to taste with salt and pepper. Serve hot and topped with crushed tortilla chips and a bit of cheese. Also delicious with a dallop of sour cream or greek yogurt. Happy Cooking my Friends! What have you been cooking and baking lately? These will either colour your stock with an odd colour or they will give it an overwhelming flavour that won't be suitable for a multi-purpose use that a stock usually is. Apologies for the iPhone photos... The last few things I've made I haven't had a chance to photograph them with my good camera, but they turned out so delicious I still wanted to share them with you. Peel and roughly chop the onions, leeks, carrots and celery. 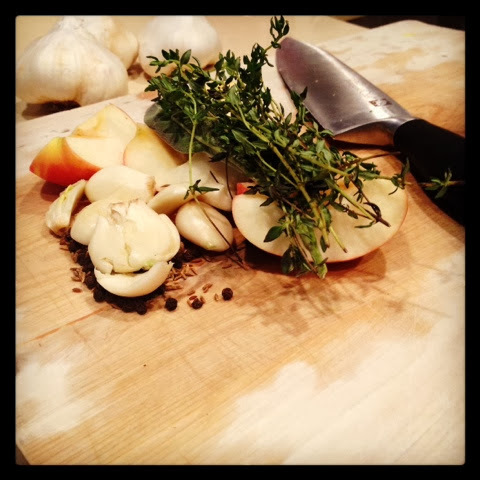 Separate the garlic bulb and smash the cloves with the flat of your knife. Quarter the apple. Heat oil in a large stock pot and add onions, leeks, carrots, celery, salt and bay leaves. Saute for five minutes, stirring often. 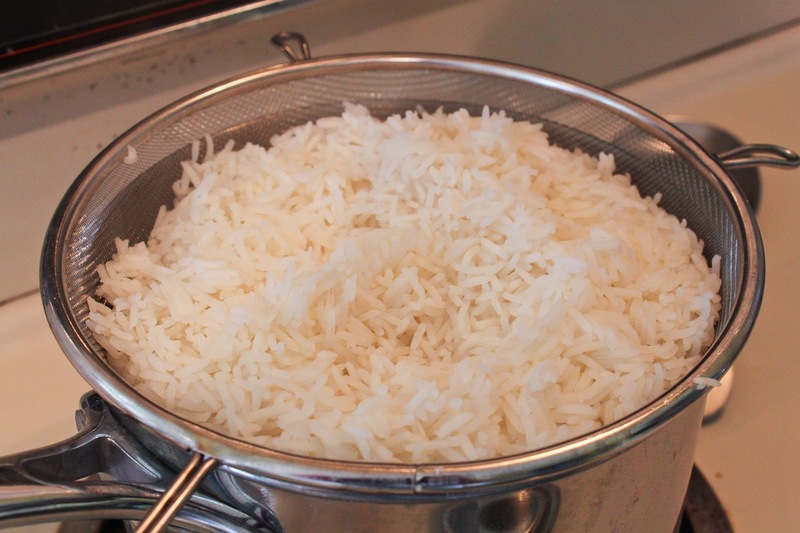 Add all of the remaining ingredients, including the water and bring to a boil. Reduce heat and simmer gently for 45 minutes. Strain and cool if not using immediately. Store in the fridge for up to 3 days or in the freezer for up to 2 months. Don't you love how easy that is? You can have fresh, flavorful and delicious stock in under an hour! Better tasting and way healthier for you than store bought. Give it a try and let me know what you think! Happy Friday my lovelies! I thought we could kick off the weekend right with a delish and refreshing wine suggestion from Forty Nine North! At $10 per bottle, you can't beat the price point! This is a fresh, mouthwatering white blend showing peach, pear and subtle floral notes. The crisp palate is filled with green apple, grapefruit, spice and citrus flavoured acidity. It is a wonderful accompaniment to seafood, white meat dishes or served as an aperitif. I really enjoyed this wine - it was refreshing, crisp and relatively dry. Let me know what you think of it or if you've tried it before!